← iTwin USB File Sharing Released in the U.S.
Posted on December 22, 2010 by Jill B. If you’re leaving your holiday shopping ‘til the eleventh hour and you have no clue what to buy for your dearest little gamer (who keeps track of what’s in their massive game collections, anyhow? ), SanDisk has a unique solution for you: the Xbox 360 USB flash drive. The flash drive is considered a third party accessory that is geared specifically toward the USB game console. It’s like taking your entire Xbox 360 with you wherever you go. It stores your games, downloadable content, map packs and profile so that you’re not confined to playing on your home console. This Xbox flash drive also saves you from having to invest in a more expensive bulky hard drive, which lacks the same portability. It’s a good looking drive, too. The flash drive is housed in a shiny black chassis imprinted with the neon green Xbox logo. They come in 8GB or 16GB flavors and are priced at $34.99 and $69.99 according SanDisk’s site. The company will also give you a free lanyard with your purchase. The 360 flash drive, packed with all of the system’s software, features a month free of Xbox LIVE Gold, which is an upgraded service that lets you do more with your Xbox 360. LIVE Gold includes streaming video, online gaming, premium game matchmaking with other users and more. The Xbox USB drive also downloads software updates so that when you take it on the go. You won’t have to worry about your content not working with other Xbox consoles that may be behind in these applications. It’s an easy solution between friends’ houses, dorm room and home or other traveling arrangements. In taking a look at online reviews (including SanDisk and Amazon) of the flash drive, it has an overall high rating from customers, who applaud its reliability and features. Many users complain about the price, which is certainly a justified gripe since an ordinary flash drive can be formatted for the same functions. However, you’ll not only miss out on the black casing with Xbox logo, but also on cool features like LIVE Gold or software updates. Additionally, other flash drives may not ensure the performance you need to battle through a game like the spacious SanDisk. You will also eliminate the hassle of trying to configure another flash drive. Down to the Christmas wire? Online and big box retailers should have you covered. 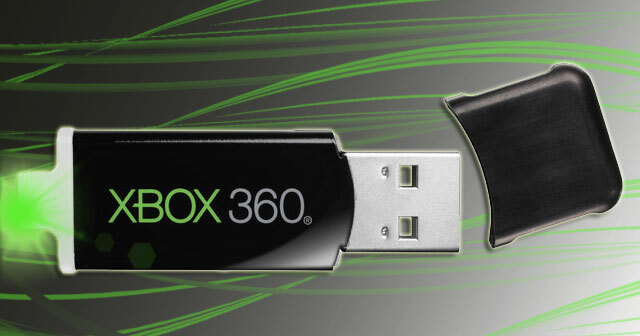 The Xbox 360 USB flash drive is available from SanDisk, Amazon, Wal-mart, Best Buy and Newegg. Do you think the Xbox flash drive is an effective way to keep track of your gaming? Tell us about your own experience with it. This entry was posted in Articles, Flash Drive, SanDisk, USB Flash Drives, USB Gadgets, USB Technology and tagged 360 flash drive, Gamer Gift, SanDisk, SanDisk Xbox 360 USB Flash Drive, Xbox 360 USB flash drive, Xbox flash drive, Xbox LIVE Gold. Bookmark the permalink.